When I was growing up I had more energy than my parents knew what to do with. I would run around all the time, and they could hardly get me to sit still. This was when my father decided it was time for me to start an extra-curricular activity. They considered dance, drama, and music, but decided I was better suited for soccer. Many parents decide to do this for their children, and I could not recommend it enough. Playing sports is integral to learning how to work as a team, is great for your health, and teaches you about winning and losing. It was around this time that my hyperactivity began to diminish as it channeled onto the soccer field. Over the years, that fun soccer “hobby” turned into my life-long passion. I trained throughout elementary school, playing on all my school teams and playing extra-curricular soccer outside of school. It was what I thought about before I woke up in the morning and then again before I went to sleep; it has always been very important to me. I had the fortunate pleasure of playing soccer throughout college while studying sport and event marketing, giving me a well-rounded post-secondary study program that taught me both sides of the game. But more importantly, I furthered my skills as an athlete and learned what is most important in the game of soccer. Nowadays, since I am a bit older, I have stopped playing but I have never stopped being invested in the sport. Both my sons now play and I am also a coach of the local high school team. It is when I started coaching that I learned the utmost importance of drills, and how they can vastly improve your game. Remember, repetition means reward, so you really need to put in the effort if you want to be a top soccer star. Scoring from outside the box is an awesome feeling, a goal line clearance makes you feel amazing and a penalty save puts you on Cloud 9, however, the ability to pass a ball is the glue which holds the beatiful game together. Developing a great passing technique will help you get out of tight situations, can quickly turn defense into attack and will give you the confidence to really express yourself on the soccer pitch. In the next sections you’ll see some of my favourite drills that I’ve handpicked to help you improve your passing technique. This is one of the most basic passing drills that you can find, however, you’ll notice the best players all over the world have mastered this technique. Top professionals will learn how to receive the ball properly, use a simple touch into space, before passing the ball to a team mate and looking for the space again. This is another of my favourite short passing drills that will help you control your range of short passes in no time. This is particularly useful for lone strikers who are trying to hold the ball up and lay off to midfielders bursting into an attack. Take it in turns to go in the middle, but also notice how the man in the middle calls the name of the person he is passing to. This next short passing drill is slightly more advanced than the Man in the Middle, where the players get to practice the crucial technique of receiving, controlling, looking up and passing in a tight space. I like the way in this drill you they’ve let their team mates run around practicing their dribbling techniques and causing added confusion to the passers in the middle. This is a fun drill. Apologies for the terrible soundtrack on this one, but this is a really nice medium to long range passing drill, which will improve not only your passing, but your control when you receive a long pass, as well as your ability to lay the ball off to a team mate. I use this alll the time in my training sessions as it’s a high tempo passing drill that will improve your touch and passing skills in no time. This passing drill is designed to improve both your passing accuracy, range and control. The nice thing about this drill is that you can start with the 2 areas close together and gradually move the distance apart, the more skilled and the more confident you become. When I first started coaching, I realized I wanted to brush up on my skills and that I was going to have to start teaching and implementing drills at each practice. It was something I never had to do before and was a great learning curve. This is when I turned to the Internet to see what tools I could obtain to help me out. 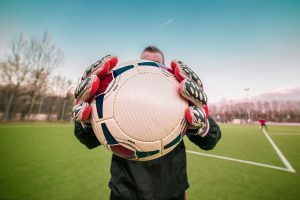 I could have used the same old soccer passing drills I used when I was just a kid, but I wanted to shake things up and try something different. This is when I came across the “Epic Soccer Training System”. At first, I was hesitant whether I should buy it or not, but since the price was, affordable and it was a professional player whom I respected who put it together, I decided to buy it. Let me tell you, I was not disappointed. “The Epic Soccer Training System,” gave me drills as a coach that I could pass onto my players. I recommended that each of them buy the system so that they could even practice these state-of-the-art drills at home. This is how good they are. More importantly, there are fantastic soccer passing drills available in this package that I use on my players at every practice. It is integral to their learning that they build a team, and also play as a team rather than individual players, each wanting to score a goal. I always tell them that the person who makes the play, and gives someone the opportunity to score a goal, is the true hero of the team. This is something I firmly believe and why most of my practices are dedicated to soccer passing drills. People are far too concerned with scoring goals and achieving the glory that they forget the importance of assisting and setting up their teammates for a goal. This is why my soccer passing drills are of utmost importance and teaches my team to pass strongly and accurately while running, and from great distances. I will leave you with this: Never forget that soccer and any other sport is all about creating a “team.” This is great to learn for beginners, but also for people who have a long history with the game of soccer. Sometimes we can forget to build team values, and that all begins with passing and sharing the ball, creating equal opportunities. Again, I recommend the “Epic Soccer Training System,” for its fantastic soccer passing drills included in the system.